Volume I lays out the basic principles of Buddhism and, in greater detail, the Buddhist Dzogchen traditionand compares them to the evolving understanding of the Transpersonal Psychology system. 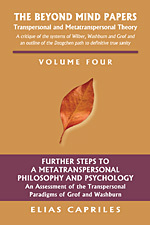 Throughout this four-volume Work, Dr. Capriles explains the correct view of Mind according to Dzogchen--in contrast to well-intentioned but misguided views among some transpersonal authorstoward what he calls the "meta-transpersonal view," whose ultimate goal is, as all agree, "true sanity." Volume II explains authentic Paths of Awakening and spiritual emergencies as mainly “descending” processes, not in the sense of involving regression, but in that of undoing pretenses and Seeing through all that is built, created, produced, contrived, conditioned or compounded, into the true condition that the Dzogchen teachings call the Base. Volume III discusses the ascender/descender debate from a standpoint different from those of both sides of the debate, showing how to avoid the “spiritual materialism” of those systems that posit the need to build successive structures rather than Seeing through all structureswhich is what Buddhism in general and Dzogchen in particular do. Volume IV further discusses the sense of “descending” in the term “descending systems,” showing that only systems that are soin the metaphenomenological, metaexistential senseagree with Buddhism. It features one Appendix on Greek dualistic philosophical systems, one on psychedelics, and one showing the “participative” perspective not to be inclusive. "Professor Capriles brings to his contribution to transpersonal psychology a formidable level of insight born of his intensive involvement with Buddhism. These volumes exemplify precisely the direction in which I for one would like to see transpersonal psychology grow: Capriles articulates profoundly innovative ideas about the nature of mind and transformational processes through a solid grasp of the insights from a specific religious tradition. It is rare indeed to find a writer who is able to comment on the works of key thinkers in transpersonal psychology from a position of such mastery." Les Lancaster, Professor Emeritus of Transpersonal Psychology, Liverpool John Moores University, UK. Current President of the International Transpersonal Association. The Transreligious Fallacy in Wilber's Writings and Wilber's Noxious "Philosophical Tradition"
Is Jorge Ferrer's "Participative Vision" Really Inclusive? Sellars' "Myth of the Given" and My Own Use of the Term "Given"
The neologisms metatranspersonal theory / metatranspersonal philosophy and psychology, rather than designating a wholly new theory produced by conceptual, deluded mind, refer to the views that spontaneously issue from the Realization or Fruit of authentic spiritual Paths, as expedient means for leading humans from the regretful, distressful and detrimental cyclic condition called samsara to the absolute freedom and plenitude of supreme, nonstatic nirvanatheir expedient nature owing to the fact that the condition from which they issue is characterized by freedom from adherence to views, on the one hand, and the capacity to put forward whichever views may lead to freedom from delusion (and hence from adherence to views), on the other. 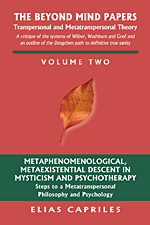 The term thus applies to the teachings of the higher and most authentic forms of Buddhism, Daoism, Bön, Shaivism, Sufism and Kabbalah, among other systems, and the most genuine mystic teachings within Christianityall of which, as all other forms of metatranspersonal theory, were conceived as a basis for genuine metatranspersonal practice and would make no sense and be useless in the absence of the latter. The reason why I coined the term metatranspersonal for the systems in question is that, when the varieties of theory and practice subsumed under the label transpersonal are assessed from the perspective of such systems (and in particular from those of the higher forms of Buddhism, and foremost from that of Dzogchen), in most of them grave pitfalls and shortcomings are detected that may be validly related to the etymology of that label. Among these, at this point it should suffice to mention the prevalent failure to distinguish among transpersonal states that are instances of nirvana, transpersonal states within samsara, and transpersonal states which belong neither to active samsara nor to nirvana and which are instances of the neutral condition of the base-of-all or kunzhi lungmaten, and to rightly appraise these three radically different kinds of stateswhich has led most transpersonal theorists to wrongly view all of them as means to achieve genuine sanity, and thus to blur the difference between the authentic Paths of Awakening and their counterfeits. What I call metatranspersonal systems, on the other hand, rather than indistinctly treasuring all transpersonal states, on the basis of a sound discrimination of the sign and value of transpersonal states, prize and employ as a Path to genuine sanity only the conditions that pertain to nirvanaand though they may also induce samsaric and neither-samsaric-nor-nirvanic states, they do so only if and when it is expedient to use them as a platform for the manifestation of nirvana. The metatranspersonal theory I expound in this and other works is based on my personal practice of the higher forms of Tibetan Buddhismand most especially of Dzogchen Atiyoga, which I set out to apply in the 1970s, having done so from 1977 through 1983 mostly in strict retreat in cabins and caves in the higher Himalayas, and thereafter as far as possible in everyday life (occasionally refreshing the practice in short retreats). 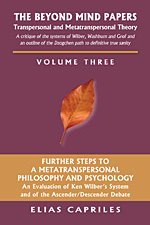 However, the theory in question is not a mere repetition of the teachings of the higher forms of Buddhism in general and of Dzogchen in particular, as it includes a sizeable quantity of concepts and explanations arisen from the standpoint of the latter in response to the disparate views of different Western philosophers, psychologists and theorists of other fieldsand, in the case of the papers contained in this book, especially in response to the distortions I perceived in the above-mentioned leading transpersonal theorists. Moreover, it incorporates what my experience in running spiritual emergency refuges in Goa (India) and Swayambhu (Nepal) in the mid 1970s taught me about psychotic and so-called psychotomimetic states.